I gotta say, I had no idea what I was missing in this world since I have only just recently discovered the world of blogging about gardening. My big loss!! But I'm there now. There are so many spectacular garden blogs out there that I want to add every single one I come across to my favorites list. But here's the thing that worries me the most - I'm getting addicted to looking for them and reading them. I can spend hours doing that. And I'm supposed to be directing my "career transition" (euphemism for finding a job) instead of doing that. Ah well, the cats don't seem to mind. Duba and Chobe are quite non-plussed by my garden blog addiction guilt. Such pretty cats! And they are almost camoflaged in the chair. I know blogging can be addicting. I try to limit myself to just a handful as I can spend lots of time reading blogs. Jon - I laughed out loud at your description of your Siamese! I also used to have a Siamese so I know how they can be. Thanks for the compliments on my two boys. 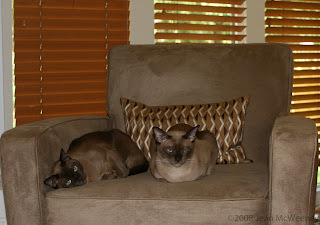 They're Tonkinese cats and Tonks used to come from breeding a Siamese with a Burmese (but now they're their own breed). All Tonks have great personalities!